Corner Specialists its finally a stick just for you; the Gryphon Taboo BlueSteel Pro.. The Gryphon Taboo BlueSteel Pro hails from a long line of sticks that have held the Taboo BlueSteel name for many years. It features and ultra-premium lay-up that makes this stick extremely powerful. It is worked through the all new Gryphon Pro Mould, which is a new-era, smooth 24mm low-bow positioned 250mm’s from the base of the head. It has a maxi shape and plays like a low-bow should. It will suit corner specialists and field players that like the ease of play that low-bows bring to the game. 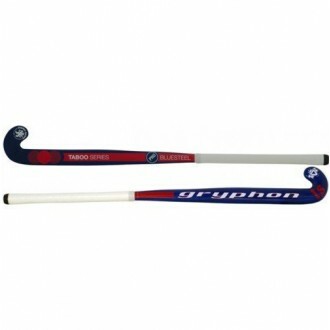 Corner Specialists its finally a stick just for you; the Gryphon Taboo BlueSteel Pro.. The Gryphon Taboo BlueSteel Pro 2012 hails from a long line of sticks that have held the Taboo BlueSteel name for many years. It features and ultra-premium lay-up that makes this stick extremely powerful. It is worked through the all new Gryphon Pro Mould, which is a new-era, smooth 24mm low-bow positioned 250mm’s from the base of the head. It has a maxi shape and plays like a low-bow should. It will suit corner specialists and field players that like the ease of play that low-bows bring to the game.